On Wednesday 14 February, the College celebrated Ash Wednesday which marks the beginning of our 40 day journey to the Resurrection Of Jesus at Easter – God’s promise of salvation for all. This season is a chance for us to take stock of our lives and particularly our relationship with God. We are offered the opportunity to fix problems and to stop and reconnect with the various elements of our lives we often sadly neglect, with a particular emphasis this year on our earth. We are called to deepen our connection with God through PRAYER, to connect with others who may be less fortunate through ALMSGIVING and to reconnect with ourselves and our blessings through FASTING. This season is one of preparation – working on ourselves to be ready for when Christ returns and to be ready for the joys of Easter. Sundays are not part of the Lenten season as every Sunday is a mini-Resurrection, and Fridays are a particular day of sacrifice from us to reflect the death of Jesus on Good Friday. The students and staff of the College engaged in liturgies in the Chapel to mark Ash Wednesday – all wearing the mark on our foreheads to remind us to ‘turn away from sin and be faithful to the Gospel’. We also tied a string on our wrists as a reminder of our Lenten promises – may we continue to connect with these each day. Every Wednesday in the Chapel at 1.30pm the Rosary is said, and every Friday will be the Stations of Cross at 12.50pm. 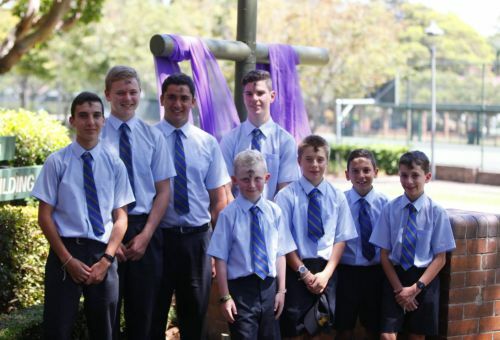 Throughout Lent the whole community will raise funds for our 2018 Lenten Partners – the Edmund Rice Centre at Homebush, with a particular emphasis on environmental protection and care for those most affected by climate change. (http://www.erc.org.au/) There are various ways to contribute, from the various stalls students run at lunchtimes to the College’s Blue, Black and Gold Dinner. Most importantly, however, is the concept of giving without expecting anything in return. We need to have an element of sacrifice in our giving. All donations are accepted and every cent goes directly to our partners – no processing charges. Tradition has required us to give up meat on Fridays. In more recent times if we do not give up meat then something else is to be sacrificed. As a tangible expression of fasting, no meat or meat products will be sold at the College on Fridays in Lent. The Conference of Leaders of Religious Institutes in NSW (CLRI) also share with us each year another way of fasting – the Lenten Carbon Fast. This can be viewed by clicking here. All staff and students have been emailed this table of fasting for every day of Lent as we also consider the carbon footprint we leave on God’s creation – our main focus in 2018. We are a faith community. The majority of Term 1 allows us to strengthen our individual and communal relationship with God who has blessed us with so much.